Exemption letters were introduced in the Russian Federation because national certification regulations contradict customs regulations. The former are based on the All-Russian Classification of Products, whereas the latter are based on Foreign Economic Activity Commodity Nomenclature (FEACN). Exemption letters are used to prove that certain goods are legally exempt from certification, meaning they do not require neither certificate of conformity nor declaration of conformity. Fire safety certificate has to be obtained in the first place. In case the goods are not subject to fire safety certification, they have to be accompanied by an exemption letter issued by EMERCOM (Emergency Control Ministry of Russia). 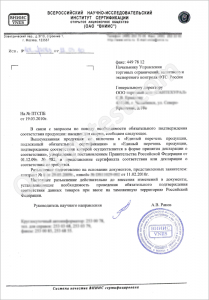 According to Russian customs regulations, exemption letter is required for goods that are not subject to mandatory certification in the GOST R system. This fact can be confirmed by any certification authority, however, Russian customs regulations require that the proof is issued by a single source. Exemption letters issued by VNIIS (National Institute of Scientific Research and Standardization) and VNIIMASH (National Institute of Scientific Research and Standardization in Engineering) are also accepted. Contact ROSTEST certification center to learn more, it’s free! Usually, exemption letters are valid for 1 year; they can also be issued for a single delivery. The number of goods listed in the letter is unlimited provided that the letter is issued for one applicant. Under Russian laws, it is totally legal to delegate the certification process to a third-party. Contact ROSTEST to get the exemption letter or any other document required for export quickly and easily.